Summer is over and what a busy summer it was! The projects I have been involved in, the places I visited and the people I met seem now very distant but the experiences are still very fresh. One particular project – Artist in Action – has been very relevant to me and to my work. From mid July to mid August, I spent a total of eight days working as resident artist in the Ark, the cultural centre for children in Dublin, as part of the Beautiful Beasts programme and exhibition. The idea behind Artist in Action was for the artist to work in a public art space where visitors could ‘look over the artist’s shoulder’ and perhaps engage in conversation about what she was doing. I was stationed at the back wall of the Long Room and there I would work away all day drawing my own beautiful beasts. I spent the first day settling into the space, starting a new piece of artwork and sort of waiting for people to approach, but they didn’t. They stayed away. Most would glance from afar, adults would refrain the children from coming too close or, they would tip-toe over lowering their voices and start whispering, afraid of disturbing me. On that first day, people never came close enough to talk. It was like as if at some point in the room there was a threshold that was not to be to crossed, perhaps there was an awareness that you were entering a special area – the ivory tower where artists create. Only the children who visited as part of groups, like summer camps, were less concerned about disturbing and were unafraid of coming over. They’d be all full of chats and questions. It was obvious then that this behaviour was driven mainly by the adults and, determined to fulfil my title of Artist in Action, I resorted to waiting until I would sense that people were approaching then, like a cat waiting for mice, I would quickly turn around and start chatting first, to break the ice. That worked well. Once engaged people had a lot of things to say. 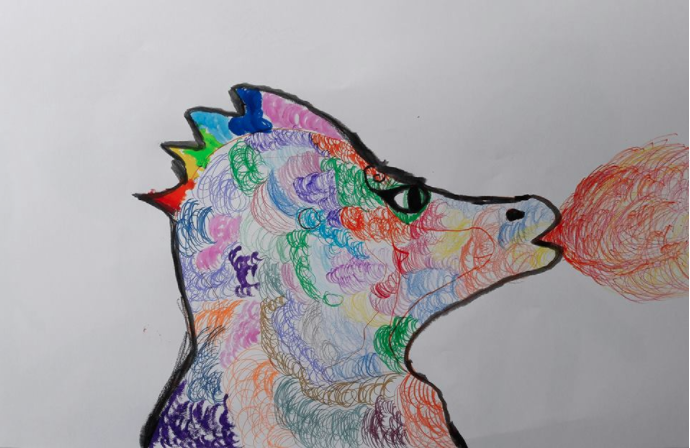 I’ve had some very enjoyable and quite profound one-to-one conversations with children about their art and how they would approach the work or where they get their inspiration from. Some of these children would mention an artist in their family, a parent or a relative, thus revealing that they were regularly exposed to the arts and therefore confident to speak about them. Often, while their children drew at the table, parents or guardians took time, to talk about their wish for a more creative life, to take the opportunity to join art classes perhaps. They would also comment at length about their children’s experience with art-making in their school, home or country. It was great to have the opportunity to converse about these matters in such a place and in a relaxed atmosphere. For once I didn’t need to be the expert, I just needed to listen. I loved overhearing the conversations between children and parents, as they worked on their drawings and I on mine, or listening to their comments as they moved form sculpture to sculpture in the exhibition. Many families came back repeatedly to spend a couple of hours in the beautiful and inspiring rooms and a few children proudly informed me that they too would be working as artists when they grew up. This reminded me of my own experience as a child when I would regularly visit my mother’s cousin, who was a ‘real artist’ with a ‘real studio’ in an attic. He didn’t mind me sitting for hours looking at him working and possibly, asking endless questions about his work! I still remember the feel of excitement as I climbed the stairs up to the attic, entering the light filled room, and smelling the paint. I was in awe in front of the large canvases stacked against the walls but most of all I loved the magic of witnessing the unfolding of a painting in front of my very eyes. A few years later I started art school. I was 14.